Portadown manager Niall Currie. 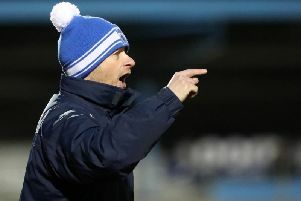 Pic by PressEye Ltd.
Currie arrived at Portadown to manage his hometown club last December but, essentially, this Saturday’s trip to tackle Larne marks the first true test of his credentials. Life in the Premiership was played out under a cloud of negativity as issues on and off the field proved detrimental to Currie’s hopes for an immediate influence towards the building blocks of future stability. However, armed with a first pre-season’s progress and opportunity to revamp the squad in his own image, Currie enters life back as a Championship manager aware of the importance of the next 10 months within the context of club history. Currie’s track record of having steered sides to Championship glory on four previous occasions cemented his standing in the search for the latest managerial appointment. Now he must deliver on the promise of that potential promotion prize. “Patience is going to be key this season as we go into the Championship as the team everyone wants to knock down,” said Currie. “That is understandable and we actually want to accept that but, in a respectful way, also flip it to appreciate no side is going to relish facing Portadown. “But the reality is no team has a divine right to anything and every step of progress and every point is going to come from hard work and commitment together. “This is a squad built for the Championship season and to achieve our single goal. “In my experience, a key difference between the Premiership and Championship probably comes down to how teams at the senior level will punish your errors. “In the Championship, there are obviously some really talented players but it is more intensive and the most important attributes are character and work-rate. “We will lose games and drop points but that is when the true test of a player’s character will come, during the setbacks. “I feel we have assembled a squad capable of handling any disappointments and having the resolve to get back at it and recover quickly. “The fans will play an important part this season and we know from past experience just how brilliant our support is but that backing will be more important than ever in the Championship. “I would ask the fans to continue to follow us in such big numbers and with the same passion, after all, it was such a motivation when players were coming off the pitch last season getting clapped by fans because they appreciated the commitment irrespective of the result. The responsibility is one Currie is happy to embrace and his drive extends beyond the current goal towards a long-term role within the Shamrock Park dug-out designed to revive Portadown’s fortunes as a top-flight force - plus maximise the development of youth which proved so productive over the past year and is anticipated to continue at pace across future seasons. “The atmosphere around the club is great thanks to so much hard work over the past number of months but we know it comes down to what happens on the pitch this season,” said Currie. “It is up to us to deliver but this is my boyhood club and the transparency which has been so instrumental towards helping bridge the divide between the fans and boardroom is also something I believe in between manager and supporters. “I have always been approachable and open with fans at every club as they remain the heart of the place. “I am always up for a conversation and know that it could become a negative if results do not go well but that is where the trust in what we are trying to achieve comes in, that the good will outweigh the bad. “I am as hungry and driven as ever in my career and it has been turbulent at times over the past few months but now we are in a really positive place together with a squad that includes a great mix of youth and experience. “We want our older players to help encourage the development of the younger players but I judge the squad on ability and players will get a chance no matter how young or old. “I have never had opportunities at other clubs to build anything from youth level up because it has always been about coming in, rebuilding and winning trophies or dealing with immediate goals. “This season has a clear target too but this is the job I have been working towards my whole career and I want it to be a long-term project. “I am connected to the managers and teams outside our senior level and know just how exciting the future is for this club in terms of the players coming up the ranks. “People say I sign lots of players and that is true, I put together squads to suit specific aims and it is always about assembling the best group I think possible to deal with that next challenge.